Move. It is designed to keep neighborhoods clean and help students, landlords and property owners during student relocations. Project Clean Move encourages students to get an early start in planning their move and seeks to educate and bring awareness about laws related to illegal dumping and trash accumulation as well as recycling efforts. The program begins on January 1, 2012. Registered property owners in the Fan, Carver and Oregon Hill neighborhoods are being notified via mail about Project Clean Move. They are encouraged to monitor their tenant’s disposal habits and curtail any instances of illegal dumping. There will be strict enforcement of City laws related to illegal dumping and trash accumulation. You can find additional information by visiting the Project Clean Move web page www.RichmondGov.com/PublicWorks/ProjectCleanMove.aspx. Mayor Dwight C. Jones and 9th District City Councilman Doug Conner today announced recommendations to improve the City’s emergency preparedness and response strategies. The Office of Emergency Management, under the leadership of Emergency Management Coordinator Anthony McLean, has been working with Councilman Conner since Hurricane Irene in August to identify areas where the City can enhance the overall emergency response efforts for residents during an emergency. Today’s report reflects the results of that review. The focus areas for improvement include: relationships with partners, emergency shelters, communication, and emergency preparedness education for residents. The City has updated its Citizens Emergency Preparedness Guidebook, created emergency preparedness refrigerator magnets in English and Spanish, and an emergency preparedness video is now available online and on the City’s government access station, channel 17, for residents. To view the updated guidebook, please visit: Citizens Emergency Preparedness Guidebook 2011. To view the Emergency Preparedness 101 video, please visit: Emergency Preparedness 101. For more information, please visit: www.RichmondGov.com. Mayor Dwight C. Jones kicked off the demolition of Martin Luther King, Jr. Middle School today in preparation for the construction of a new, state of the art, Martin Luther King, Jr. Middle School (MLK). Mayor Jones, joined by Superintendent of Schools Dr. Yvonne Brandon, MLK Principal Valerie Harris along with City Council members and School Board Members from the 6th and 7th districts, watched as an excavating machine took a chunk out of one of the buildings that will come down. 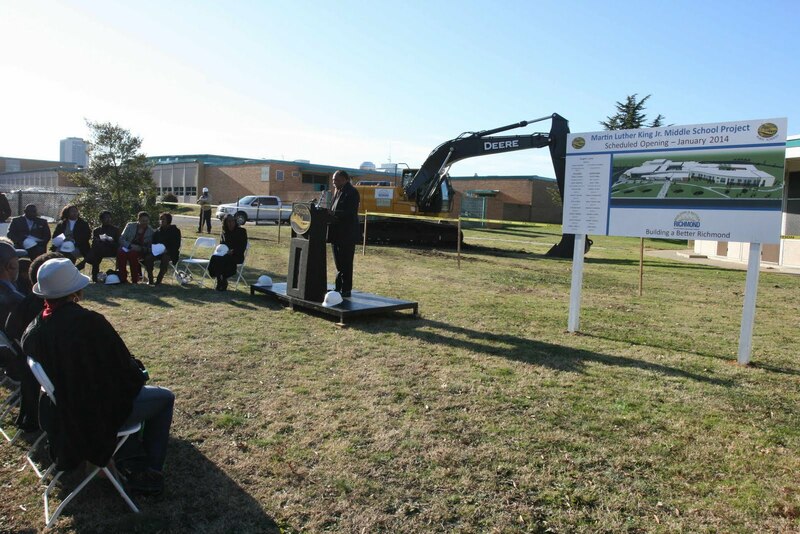 The Jones Administration has broken ground on two new elementary schools since taking office and today’s action was the first taken on a new middle school. A new high school is also planned. A clinic and pre-K center. Participating in today’s demolition ceremony were 6th District City Council Member and Council Vice President Ellen Robinson, 7th District City Council Member Cynthia Newbille, 6th District School Board Member Chandra Smith, 7th District School Board Member Don Coleman, Superintendent of Schools, Dr. Yvonne Brandon and MLK Principal Valerie Harris. Click here to view the start of building demolition.